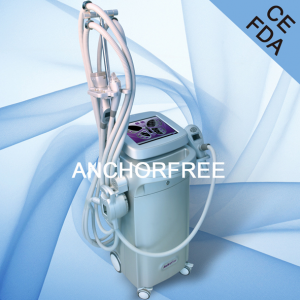 5 Technologies in one machine — Ultrasonic Cavitation + 940nm Near-Infrared Laser + Bipolar RF + Endermology + Rollers. 940nm Infrared laser reduces skin impedance by heating skin and RF energy penetrates deeply into connective tissue; The synergistic combination of infrared laser and conducted Bipolar RF energies increase the oxygen intracellular diffusion by heating the skin Vacuum plus specially designed rollers manipulate leads RF penetration to be even 5-15mm. At the same time, Cavitation, Endermology and Rollers mechanical tissue manipulation nips and stretches fibrillar connective tissue, effectively breaks down subcutaneous fat as well as extruded capillary vessel, Increase lymphatic drainage, promotes metabolism and reduces or shrinks the size of the actual fat chamber and greatly improved body contouring effect; The technology that vacuum folds skin makes RF energy penetrate a specific folded skin, greatly improve effect and safety, even for the upper eyelid area treatment.